Gamers are always in search for great games that pique our interest, though each person has their own individual tastes. Going into my review of Snark Busters: High Society, I had no experience with the developer’s previous plot-driven puzzle games. Actually, besides the I Spy books I have not played a hidden object game on any console. I tried to keep an open mind as played through the game and I soon had the desire to see the end credits. 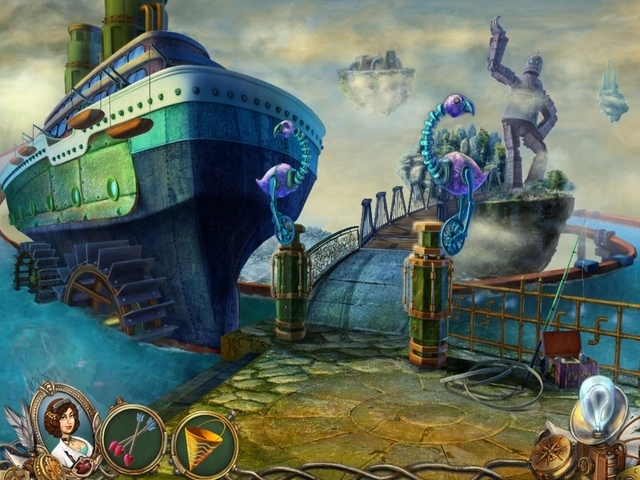 I want to begin by saying that Snark Busters: High Society has high quality production values for a hidden object game. Most of the game takes place on a variety of motionless backdrops, but the animations and cut scenes that display after you finish a puzzle are great. I will also give props to the developer for implementing a fairly intruiging, if mediocre, plot. You are a detective trying to uncover the truths about a duchess that pinned a robbery on your boyfriend. Simple enough; add in hidden objects, a few puzzles and ghosts, yes ghosts, that help you uncover the mystery. I also enjoyed the ‘news’ that came on the T.V. that relayed unfolding events. The developers could have written off the plot, but having one puts the gameplay in some context. Likewise, each item that you must find are not random trash but function instead as intentionally placed components for a bigger device. For example, at one point you'll search for a wire, battery, some metal pieces, and pliers to make a robot that helps you get another hidden piece. The puzzles add a nice layer of depth, but are very mundane and can even be skipped entirely. Why bother having them in there in the first place? For as much praise I have given the game, I did not enjoy it to say the least. I found it very frustrating when all the hidden objects had a tendency to spill into another screen with even more hidden items. To make matters worse the second, third or even fourth screen still did not have all the objects. The layout of these chapters has you doubling back to remember which piece went with each puzzle which amounted to complete irritation. At some points in the game, I honestly felt like I was just cleaning up the screen of all the clutter because most objects stuck out like a rose among weeds. It was irritating to know that you will never complete a puzzle until you finally get to the end of the chapter and everything starts fitting into place. I do remember the main character mentioning something sly like, "Oh, this looks like another puzzle I have to solve" which I applaud the developers for trying to make sense out of the game. After playing this game, I think I have a new hatred towards mirrors for reasons I will not spoil. I hate to bash a game, but I felt like I was wasting my gaming time. When I play a console game, I either want an intriguing story, complex gameplay mechanics, or engaging competition all of which High Society has none. This game is available on smartphones, which I think is a far better fit. As far as the consoles are concerned, priced at $11.99 this game does not warrant a purchase unless you really enjoy plot-based hidden object games. Or any hidden object game for that matter. John St. John, pretty visuals, and a great story to get behind, Rochard is a sleeper hit. Learning how to long jump in low gravity or just launching grenades through five different force fields to destroy one small piece of metal for a trophy gets my fingers itchy. Another great game to play, but who am I to tell you. Figure it out for yourself. Alabama. As a hidden object game, this will definitely appeal to casual gamers and puzzle enthusiasts, although the story and overall premise may turn off a hard-core audience. This game could be played competitively, but is one that I will come back to as a great pick-it-up and play.